Mid-level al Qaeda leader captured, and a market has a grand opening. 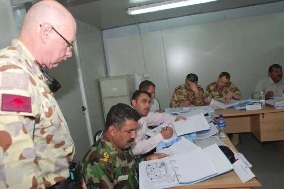 A most interesting story is a Coalition Force joint effort to teach international law to Iraqi Security Forces. Many criminals detained or killed and large weapons caches turned in. BAGHDAD – IA advised by U.S. SF, detained a suspected mid-level AQI leader and detained 6 others in Kirkuk province, May 5. The suspect was reportedly leading an effort to consolidate and reorganize AQI in the province and has been focusing on IED attack coordination, foreign fighter facilitation, and planning the murder of SoI members. The detention of all of these suspects will likely disrupt AQI activity in the region and possibly yield info on other AQI leaders in Kirkuk province. BAGHDAD – May 6, 3 separate caches were found containing a total of 24,000 .50 caliber rounds, 50 mortar rounds of various sizes, and 2,000 gallons of nitric acid, a substance used to make homemade explosives. The mortar rounds were destroyed on-site by a CF EOD team and the nitric acid was taken off-site for disposal. FOB KALSU – CF captured 5 detainees during Op Berlin, May 4 in the Musayyib area, 55 km south of Baghdad. Two of the detainees are key suspect targets believed to be involved with weapons trafficking, kidnapping, murder, IED making and sniper attacks against innocent civilians and CF. The 2 simultaneous ops were executed in 2 different locations. MND-C Soldiers conducted an op and detained 3 suspects, as well as AK-47s, a bolt-action rifle, pistols, a 62 mm MTR sight, a defused grenade, body armor, a hand-held radio, a sniper rifle technical manual, an IA uniform, cell phones, more than 20 pounds of PKC/RPK weapons repair parts, hundreds of 7.62 mm rounds and more than $120,000 in Iranian currency. MND-C Soldiers conducted the other op and detained 2 individuals, as well as an AK-47, a pistol, cell phones, body armor, a computer hard drive and a hand-held radio. “The role of the local citizens in the successful execution of Op Berlin serves as yet another example of the Iraqi people stopping the ops of criminals and outsiders in the Musayyib area,” said Lt. Col. Timothy Newsome, 3rd Bn, 7th Inf Regt cmdr. BAGHDAD – Iraqi SF and CF seized 3 weapons caches and destroyed an enemy fighting position in ops across Baghdad, May 6. At approx. 11:30 a.m., MND-Baghdad soldiers found a weapons cache during a mine detecting mission northwest of Baghdad. The cache contained 14 82 mm mortar rounds and various bomb-making components. At approx. 4 p.m., soldiers discovered a cache containing 25 pounds of home made explosives in southern Baghdad. At approx. 4:15 p.m., an AWT engaged and destroyed an enemy fighting position in Sadr City. It is unknown the number of criminals, who were attacking CF with small arms fire, were killed or injured in the engagement. At approx. 5 p.m., IA soldiers located a weapons cache in western Baghdad containing an IED, a 57 mm rocket and a grenade. FOB FALCON – Noticing suspicious behavior while conducting an op in southern Baghdad at approx. 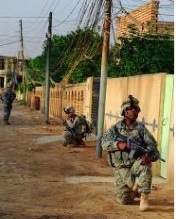 2 a.m., May 6, HHC, 4th Bn, 64th AR, attached to the 1st BCT, 4th ID detained, among others, a known criminal responsible for indirect fire attacks in Baghdad, and another member of a criminal cell. BASRA – The newly constructed Jameat Market held its grand opening in Basra, May 6. The al Jameat district was once one of the most notorious areas of Basra. Until recently, it was a stronghold of the Shia militias, but now it hosted dignitaries from the Provincial Council, local businessmen, potential investors and the local media. The market’s opening is considered to be another success from Op Charge of the Knights. Peace and security has been restored to the streets of Basra, while only a small IA and Police presence can be seen. Traditionally, markets have always acted as community focal points in Iraq. In fact, many women and children also attended the opening ceremony because they had been let out of school early to watch the community building event. Proposals for similar markets in other districts of Basra are being considered to build on the success of the Jameat Market. 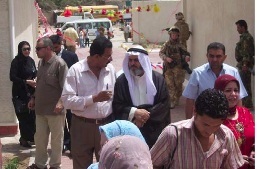 Engineering Directing General Municipality Ishmael, center left, in charge of reconstruction projects in Basra, talks to Provincial Council Member Abu Salem during the grand opening of the Jameat Market. Local men and women watch the grand opening ceremonies. Children had been let out of school early to attend. BAGHDAD – During night ops in Baghdad, May 5-6, at approx. 6:35 p.m., Iraqi soldiers discovered 6 RPGs and 2 EFPs in New Baghdad. IA soldiers while on patrol, discovered 32 81 mm mortar rounds west of Baghdad at approx. 7 p.m.
At approx. 7 p.m., Iraqi NP discovered a weapons cache in the courtyard of the Imam Ali Mosque in the al-Ghadier neighborhood of Baghdad, including 5 EFPs, 2 IEDs, 5 rocket rails, 3 grenades and numerous rounds of various ammo. At approx. 9:20 p.m., Special Groups criminals fired upon a barrier emplacement team in Sadr City. An AWT was called in support of troops in contact and fired a Hellfire missile, eliminating the criminal threat. Soldiers from 1st Bn, 64th AR, 3rd ID, currently attached to the 3rd BCT, 4th ID, and IA soldiers were attacked with RPGs in Sadr City. IA soldiers engaged the dismounted criminals with RPGs, and soldiers from 1-64 AR fired 2 M1A2 Abrams tank rounds, killing 6 criminals. At approx. 2:50 a.m., an AWT witnessed criminals emplacing an IED in New Baghdad, fired 2 Hellfire missiles and killed 3 criminals. FOB KALSU – In an effort to clear out criminals in the area, IA Soldiers, with support from CF, secured several houses in the city of Jabella, May 2. The op resulted in the detainment of 29 suspected insurgents, with help from Soldiers of 502nd Inf Regt currently attached to the 4th BCT, 3rd ID. With info from Iraqi intel, the soldiers set out clearing the area of caches, suspected criminals and illegal weapons. “This was actually a completely IA (conducted) op,” Comfort said. “They were in charge of planning and coordinating the op.” During the maneuver, IA came across more than 50 AK-47s, SKS assault rifles and assorted ammo. The detainees and weapons were turned over to the IA Soldiers for further questioning. The daytime op was conducted in support of Op Marne Rugged, an op to establish security for local Iraqi communities against AQI and criminal forces. 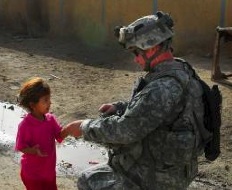 Sergeant 1st Class Lyle Whitted, gives an Iraqi girl a piece of gum. Soldiers assigned with 2nd Bn pull security. 1st BCT, 82nd Abn. Div. COB ADDER – Members of the 1st BCT of the 82nd Abn Div, Australian Army and Italian PRT of Dhi Qar Province teamed up to train members of the IA, IP and 4th Military Academy on international law and human rights recently. 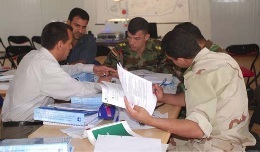 A group of 18 Iraqi servicemembers attended a 10-day course to learn basic principles of the Law of Armed Conflict, human rights, police ethics, and their legal obligations and responsibilities while conducting ops. 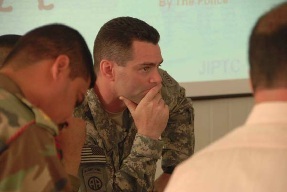 “The course was focused on training legal advisors and operators for the Iraqi SF,” said Capt. Eric Widmar, brigade judge advocate of 1st BCT and course instructor. “The focus was to train them on the Laws of Armed Conflict with a focus on the Geneva Conventions and the Hague Conventions. The legal obligation to distinguish between combatants and civilians, the legal obligation to care for the wounded and the treatment of detainees and other human rights subjects were taught. It’s very, very relevant to these guys given the security situation. The whole intent of this was to enable these key leaders, legal advisors and operators and law faculty members to take this info back and train more people. It was essentially a train-the-trainer program on international law and human rights,” said Widmar. “I think it was a successful course, and we are making use of the info that we received here during the course,” said Lt. Al-Ataby, an officer with the IP who attended the course. “The training is very valuable, and we are planning to have these types of courses in the future with our colleagues and officers in order to teach them what we learned. It is extremely important to continue doing such courses,” he added. For some, this was the first time they received information on some of the topics taught in the course. “I think this course was very important because it was the first time we’ve learned and received so much info on international law,” said Lt. Col. Al-Kadhim, a member of the military academy and course attendee. “The most rewarding experience was to sit back and hear them articulate arguments based on law instead of just raw emotion,” said Widmar. Maj. Stephen King, an instructor of the Law of Armed Conflict and Human Rights course, helps his students with one of their group assignments during class. Capt. Eric Widmar, an instructor of the Law of Armed Conflict and Human Rights course, listens as his students debate a principle of law. Iraqi students work on an assignment during class.